An inspection company should provide peace of mind when buying or selling a home. The Logue team has been helping buyers and sellers since 2000 performing over 16,000 home inspections. They have been one of the top rated Pillar To Post franchises in Florida consistently exceeding expectations of their clients. 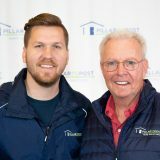 Danny started Pillar To Post Home Inspections in 2000 and has grown the company to a multi-inspector firm which services North Pinellas County and the surrounding areas. Buying a home should be a pleasant experience. Here at Pillar To Post we strive to make that a reality. A Pillar To Post home inspection of the home you are considering will help make an informed decision during the purchase process. It will also provide you with the information you need for any repairs and maintenance your new home may require. We are a one stop shop. We coordinate all inspections, including a separate termite inspection company that arrives at the same time as the home inspection. Our professional home inspection will allow you to buy with confidence. Upon completion of the inspection, a computerized Inspection Report is printed on-site and presented in the Pillar To Post Report Binder, which also includes a seasonal maintenance schedule and a home filing system for important records and receipts. Digital photos are also utilized to better describe any recommendation that we would have the client be aware of. You’ll also have online access to your report at anytime. Wind Mitigation and 4-Point Inspections – These inspections are crucial to saving on homeowner’s insurance. Roof: The condition and life span of the roof. Plumbing: What kind of piping (copper, plastic, etc. ), leaks, flaws, and the hot water heater. Electrical System: Size of the main service, any dangerous wiring, and dates of any upgrades. Heating and Air Conditioning: Date of installation of the system, life span, and functionality. A Wind Mitigation inspection is common in coastal areas of the country. This inspection will determine the appropriateness of a given structure’s construction in the event of strong winds, such as those present in a hurricane. In Florida, premium discounts for certain favorable wind mitigation and 4-point features are mandated by State law and can total 45% of the original policy’s premium. As the local Pinellas County and Tri County home inspector Danny Logue is very involved with the community. Collectively, our team of home inspectors offer more than 30 years of experience in the Home Inspection Industry. Real estate professionals use our home inspection services because of the commitment we have to understanding that their reputation is our responsibility, and that a relationship with us reinforces the confidence their clients have in them. Many real estate professionals refer our services to clients because they are assured of the high level of customer service and top quality inspection. Home buyers report that our our work is a detailed explanation of the condition of the potential new home, to which an emotional attachment is already being formed. Home buyers trust us to find and report any potential problems without causing undue alarm or apprehension. A home is a big investment, and buyers want to know the true condition of a home before making this investment. They trust us to inform and educate them about the home before making a final decision on the purchase. Home sellers use our services because they know that our work is to honor the home they have lived in, and to accurately report on the condition of the home they have grown to love over time. If there are no concerns with a home then this is what we report, and home sellers trust us to provide an accurate and unbiased report of the home inspection findings.